Let customers ask questions right on product pages to instantly receive any specific information they need. Create and manage your own product knowledge base to provide store visitors with the answers to the most frequently asked questions. Looking for an easy-to-use tool to improve your customer service and enhance user satisfaction with minimal effort? Due to the advanced FAQ and Product Questions extension you'll provide store visitors with a great opportunity to ask about any details right on product pages and get precise answers from store administrators. Moreover, with the Magento FAQ extension you can create and manage your own knowledge base, assign questions to corresponding topics and let customers rate your answers. Moreover, the module is completely GDPR compliant right out of the box. If you want not only a single module but the entire store to be compliant, you can take a look at our Magento GDPR tool. At least one-fifth of the queries on Google are voice searches. And the indicator is stably growing. That’s why optimizing for voice search becomes crucial for your SEO success. To make your site appear in voice search, your content should rank high in organic search results. With Magento 1 FAQ and product questions, you will significantly enrich your content and get top positions in SERP. Moreover, FAQ and product questions often get to Google “zero results”, which appear above the traditional #1 ranking position. All this drastically influence the chance of your site getting to voice search results. Due to the flexible FAQ Magento extension you can enrich your Magento knowledge base either with your own questions or add the most popular questions left by store visitors on product pages. This way you won't have to spend time on collecting and rewriting customer questions and will be able to quickly grow your knowledge base. With the FAQ Magento 1 module you can create as many different topics as you need. Assign questions to one or multiple topics to help customers easily navigate your FAQ section. Specify short SEO-friendly URLs for each topic and question you create to help customers easily share useful information with others and add pages with answers to bookmarks. 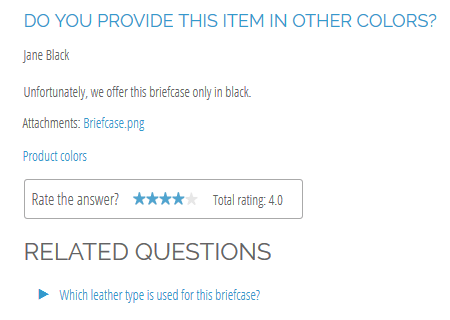 Make any questions visible on corresponding product pages. Assign customer questions as well as the questions added by admin users to store products, thus helping users find the answers to most frequently asked questions not only in the Magento FAQ section, but right on the product page. Let shoppers quickly find necessary information in the knowledge base. Enable them to search by question tags, topics or among the questions displayed under topic titles. Also, you can limit the number of search results per page. In case customers don't find information they need, they can ask a question right on the Magento FAQ page and get an instant answer from an admin user. Admin users can choose which questions to show as related. The two-way relation option automatically makes selected questions mutually related to each other. Let visitors rate your questions on product and knowledge base pages either with stars or like/dislike criteria. See which information helps them and improve your content accordingly. Due to highly adjustable FAQ Magento extension settings you can choose the layout type to match your custom theme. It's also possible to display any selected CMS block on the FAQ section page. Add apealing social media buttons to allow your visitors share the FAQ content in a click. Enable or disable social sharing buttons and adjust the list of the available social media. Spread your knowledge base content and attract new visitors to the store. Let store visitors ask questions right from product pages with a handy question form displayed in a popup. Show an additional "Ask a Question" link on top of a product page to help customers quickly find and fill in the question form. Display a questions tab on each product page to help users find useful information about the item they are going to purchase. The tab can be filled in with customer questions as well as with the ones added by admin users. If you are moving to Magento 2 and the appropriate version of FAQ and Product Questions extension, than you can quickly export all the knowledge base to tranfer it to your new store. Send email notifications to customers once the answer to their question is posted. Apart from that, the Magento product questions extension supports an admin notification feature. Therefore, each time a new question is sent by a store visitor, the administrator will be instantly notified. View and manage all customer questions on a handy Questions grid. The Magento product questions module enables you to delete selected questions in bulk right from the grid. 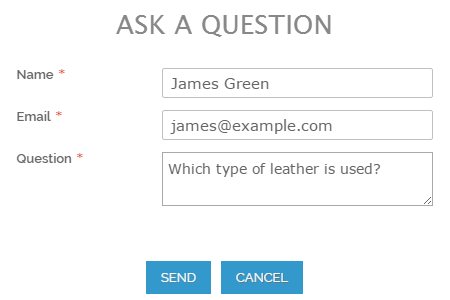 Assign questions to necessary topics or product pages, write answers and edit customer info just in a few clicks. The Magento FAQ and Product Questions extension comes with the built-in Google Invisible reCaptcha module that protects your question form from spam and frauds. Benefit from the most advanced security tool and boost your store security. Although the extension needs some finetuning as a captcha and maybe some rich snippet features. This is a very nice add on for each store. Amasty development crew is nice and fast, as always. This is really an amazing FAQ extension. The settings are easy to understand and set up, the feature is really useful. - add a new column to the grid where I can search for the products to which questions are assigned. This would make the process of managing the QA section much easier. - one more thing is to add a column for topics where questions belong to, like general, shipping questions, etc. - add a possibility to customize the FAQ tab on product pages. Though current look is quite good, i would still like to have a few sections instead of one. I'll be waiting for updates! Worthy plugin, easy to configure and manage. All features work as in the description. The only issue that prevents me from calling it totally perfect is the lack of possibility for customers to answers questions of other customers. This option would definitely enriched the pool of useful info and helped to gather customer feedback. All in all, the app definitely met our expectations.